What are admission criteria for transfer students? So, when will I graduate from OBU? What if I attended a college that was not accredited? How am I going to pay for OBU? Do you offer scholarships? What housing options are available to me as a transfer student? So, how do I sign up for housing? Am I guaranteed to get the residence facility I request? What amenities and services are offered on campus? As a transfer, can I still be involved in student organizations like honor societies, student government, ministry opportunities, social clubs and other groups? Do you have orientation opportunities for transfers? How will I decide if OBU is the place for me? A: It's pretty simple. Just start by filling out an application for admission, either a paper copy or online at www.okbu.edu/apply. It's fast and it's FREE! Then request that final official transcripts from all previously attended institutions be mailed to the OBU Office of Admissions, OBU Box 61174, 500 West University, Shawnee, OK 74804. If you've completed less than 24 college credit hours at the time of application, you'll also need to provide additional information including a final official high school transcript and an official ACT or SAT score report. If you wish your CLEP or AP credit to be applied to your transcript, we must receive official score reports with your test scores to determine if you've met OBU's requirement for advanced placement credit. Once OBU has received your official transcripts, you will be notified of your admission status by mail. Q: What are admission criteria for transfer students? 3. If your transcript does not include extensive remedial academic coursework. Students whose overall college grade average is below 2.50 or whose transcript includes extensive remedial academic coursework may be admitted on probation at the discretion of the Admissions Committee. Q: What majors do you offer? A: OBU offers over 80 areas of study including such things as business, nursing, communication, ministry, teacher education, science, social sciences, fine arts, kinesiology, and many others. A: OBU will look at each and every course you've taken individually and find its closest match on the OBU degree plan you've selected. In other words, we don't transfer an Associates' degree in as a "block". Courses need to be similar in content and organization of OBU courses required for your degree. Please make sure the Office of Admissions knows the major you intend to pursue. Changing majors may influence the application of your transfer credit. Credit determined to be applicable toward one major may not necessarily apply toward another. 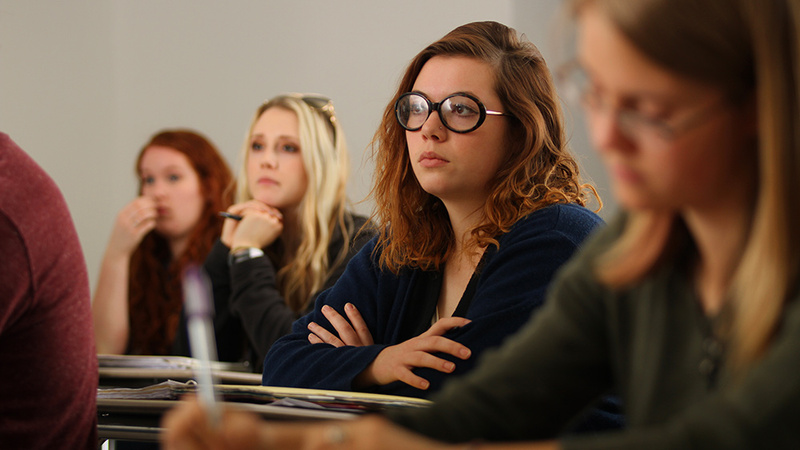 Up to 64 credits from a junior or community college may be counted toward your degree at OBU, but none of them may count for upper-division major courses. Q: So when will I graduate from OBU? A: When you receive your transcript evaluation back, you will see the number of credit hours you need to graduation. How long it will take you to complete your degree depends on how many credits you take each semester and whether or not you take January term or summer courses. Since OBU charges a block tuition rate during regular semesters, you can take up to 16 hours per semester for the same price as 12. It's to your advantage to take more if you can-both financially and in terms of completing your degree at a faster pace. Also, you must complete at least half of your major and six hours of your minor at OBU. 33 of the last 64 hours required for your degree must be completed at OBU. Q: What if I attended a college that was not accredited? A: OBU cannot accept course work credits from institutions not accredited by a Council for Higher Education Accreditation (CHEA) or United States Department of Education (USDE) recognized accreditation organization. Non-accredited institutions include vocational or trade schools and other institutions whose purposes and curricula indicate their restrictive nature. However, after earning 24 credit hours in residence at OBU with a GPA of 2.00 or higher, credits earned at a college or university not accredited by a CHEA or USDE recognized accrediting organization may be applied to the student's OBU transcript as applicable credit for a degree. Q: How am I going to pay for OBU? Do you offer scholarships? A: OBU realizes that your financing your education is a commitment that can cause some anxiety. However, we will do our best to help you see what options are available to help meet your financial need. Both federal and state aid are accepted at OBU, so filling out your FAFSA (www.fafsa.ed.gov) as soon as possible is the most important way to begin. Even if you haven't qualified for aid in the past, we encourage you to start here so OBU can determine your level of financial need and show you what scholarships you may qualify for here. The PTK Scholarships are for transfer students who are members of Phi Theta Kappa. A: Yes! Living on campus is a great way to build lifelong friendships and participate in the campus community. In fact, OBU requires all unmarried students under 21 to live in University housing unless the student is living with parents. Q: What housing options are available to me as a transfer student? A: Learn more about OBU housing. Q: So how do I sign up for housing? Am I guaranteed to get the residence facility I request? A: Once you're accepted for admission, you will receive an OBU campus housing application. You must turn this in along with your $125 enrollment guarantee before a housing assignment will be made. Housing assignments for new students are processed around May 1 for fall transfers and December 1 for spring transfers. Although OBU will always try to honor a student's preference, returning residents have a choice of residence halls before new applicants are assigned. Remaining places in residence halls and apartments are assigned according to University policy, student preference, the date the completed application and enrollment guarantee is received by the University and the student's GPA. Q: What amenities and services are offered on campus? A: All University housing units come complete with air conditioning, carpet, cable television, high-speed internet access, telephone service, and laundry facilities. On-campus students have an OBU mailbox. OBU has several computer labs open for student use. Wireless internet access is also available in many locations on campus. OBU's Department of Student Services offers Career Placement and Planning, free & confidential personal counseling, and disability services. OBU offers 24-hour campus security for students-both in night security guards in the residence halls and patrolling campus safety officers. OBU's brand new Wellness Center is open for student use. Facilities include a pool, indoor walking track, climbing wall, cardio machines, and weight training equipment. Q: As a transfer, can I still be involved in student organizations like honor societies, student government, ministry opportunities, social clubs, and other groups? A: Definitely! In fact, we hope that you will take the initiative to become involved in one or more groups to enhance your on-campus experience. OBU offers many different groups, activities, and clubs. Watch campus announcements for kick-off events and sign up information. Attending events during Welcome Week designed to acquaint you with how to be involved is the best way to get started. Q: Do you have orientation opportunities for transfers? A: OBU sponsors a Welcome Week in the fall for all new students-freshmen and transfers. Transfers are encouraged but not required to attend. You will be assigned to a small group of transfer students to discuss issues and get to know other new transfer students. There are a wide range of activities, and we encourage you to look through the schedule and choose the activities you'd like to be a part of. If you transfer in the spring, there is a Welcome Weekend with get-to-know you activities scheduled by previous transfer students. Q: How will I decide if OBU is the place for me? A:We suggest a campus visit. While we know the importance of your credits transferring and availability of scholarships are very important factors as you consider schools, we also realize that you need to find a school where you feel a fit. Schedule a campus visit to spend a day in our environment. You can visit a class, meet with a faculty member in your major area, attend a chapel, check out housing options, and eat in the cafeteria. We hope you'll find that our small class size, Christian atmosphere, and close community will be a great fit for you!